-Air aluminum is characterized by high strength, light weight and easy to carry. -The door is locked with a hook-proof system designed to prevent crochet, which is especially important when you reach the protection station with all your efforts. -Breaking load mark: long shaft 25KN(about 2500kg of force) short shaft 8KN (about 800kg of force) open lock 7KN (about 700kg of force). -The rotary design with screw thread requires manual rotation when closing and opening the lock. The design is ingenious. -The type locking buckle, which makes it easy to connect, will keep the safety belt and protection tool fixed at a good bearing position of the long shaft, and can withstand up to 2500 kg of impact force. -Fine polishing process is adopted to reduce metal surface roughness, uniform color and feel comfortable. -Colorful appearance, fashionable color and metal equipment clever fusion, using fine polishing process, warm color color touch comfortable. 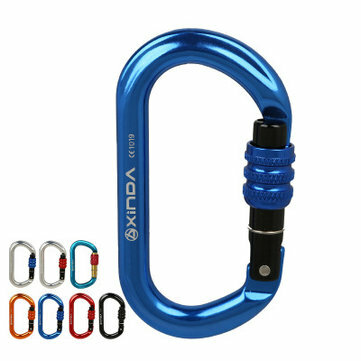 1*Oval Shape Screw lock carabiner.